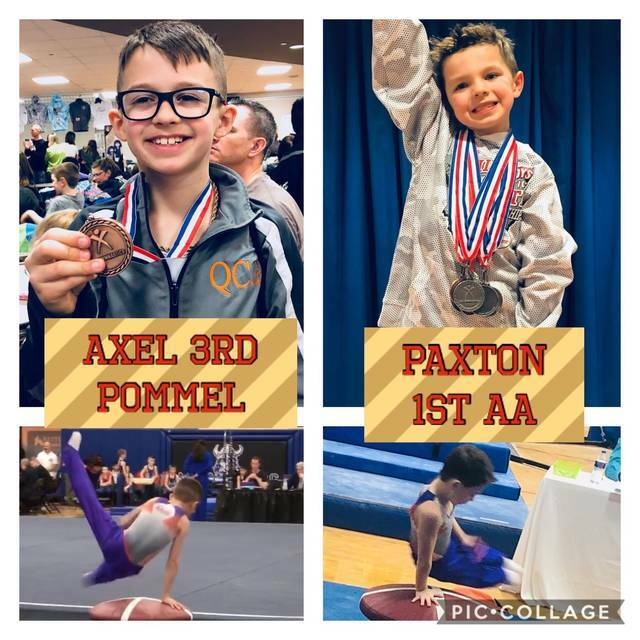 Two Clinton-Massie Elementary School students placed in the 2019 Ohio USAG Men’s State Championship gymnastics tournament this past weekend at Miamisburg High School. Axel Stretch, 9 and Paxton Smith, 6, both of Wilmington, competed on compulsory teams for Queen City Gymnastics out of Cincinnati. This is the first year of competitive gymnastics for both boys. Smith, a level 4 gymnast, medaled in multiple events at the meet. He received the gold medal for AA in his age group. He also placed second in floor (9.7), pommel (9.9) and parallel bars (8.8). He also received a 10.0 on rings, which gained him a fourth place medal. Smith’s team finished first in their age group and second AA for their level. Stretch, a level 5 gymnast, received a bronze medal in pommel horse in the state for his age group with a score of 10.7. His team placed second in the state in both their age group and all-around (AA).